JETNET LCC on any given workday has around 50 people in its Utica, New York, headquarters phoning and emailing aircraft owners and operators to produce some of the aviation world’s most unique, practical and accurate research. Its goal is to reach approximately 500 people every 90 days to create a small sampling error of about four per cent in its data. Over the past seven and a half years, JETNET has spoken with or received industry surveys from more than 15,000 owners and operators worldwide – in 129 countries. Data from this herculean collection effort – designed to accommodate a marketplace comprised of more than 110,000 commercial, corporate and helicopter airframes – is then analyzed and disseminated through the company’s analytical branch JETNET iQ, which was formed in 2011 in collaboration with aviation consultancy Rolland Vincent Associates LLC of Plano, TX. JETNET iQ surveys are designed to read the pulse of the business aviation community on such issues as their regard for major airframe and engine brands, intentions for future aircraft utilization and purchases, perceived obstacles to new aircraft purchases, and overall marketplace sentiment. In mid-June, Rolly Vincent at the Canadian Business Aviation Association conference in Waterloo, Ont., described the state of the business aviation market by drawing from JETNET iQ’s latest quarterly report. “We have been monitoring things very closely for the last 7 1/2 years and we have never seen the markets as optimistic as they are right now,” says Vincent. A couple weeks earlier at EBace in Geneva, Vincent explained net optimism – the difference between respondents who indicate market conditions are “Past the low point” and those who say they have “Not yet reached the low point” – measured almost 45 per cent in Q1 2018 within the fixed-wing turbine-powered owner-operator community. This is the highest number JETNET iQ has ever measured in 29 consecutive quarters since the survey began in Q1 2011. He notes 65 of respondents for JETNET iQ’s most recent report are Canadian, who indicate Canada has a large proportion of turboprops, with multi-engine aircraft representing 23.6 per cent of the country’s fleet and single-engine turboprops accounting for 21.7 per cent. 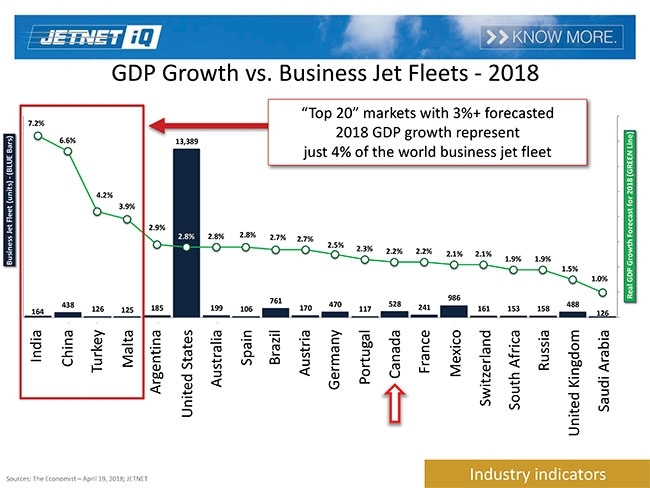 In terms of business jets, Vincent explains the numbers are largely driven by the U.S., which holds around 60 per cent of all aircraft, followed by the European region at some 14 per cent, with Canada contributing one to two per cent of the worldwide fleet. JETNET iQ is currently tracking that nine per cent of the world business jet fleet is for sale, which Vincent describes as a “pretty good place” – lower than it had been for many years, even as the time it takes for an aircraft to transact continues to run at around 300 days worldwide. JETNET iQ looks heavily at the pre-owned market because it provides a better pulse for the industry, as opposed to relying solely on quarterly order and backlog reports from larger public companies. “The uptick in 2017 emptied a lot of young inventory out of the market, so right now if you are looking for a pre-owned aircraft less than 10 years old, that has only been flown on Sundays at the Waterloo Airport, and kept indoors at that beautiful Chartright hangar, as they say in Quebec, bonne chance. There is nothing out there,” says Vincent, giving a nod to the host locations of CBAA 2018. He also notes that among the five largest business aircraft OEMs – Bombardier, Dassault, Embraer, Gulfstream and Textron – only Bombardier and Gulfstream have any meaningful order backlog greater than three months.